To understand where I am coming from on all issues having to with dogs, I am going to give you a little background information. I grew up with wire-haired Fox Terriers. We always had a dog, so of course when I was out on my own I wanted a dog. My now ex-husband I did the worst thing you can possibly do when getting a dog. I don’t know how it happened, but we found an ad in a paper for wolf hybrid puppies. 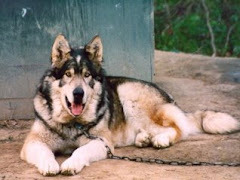 Alaskan Malamute/Tundra Wolf cross. If you don’t know anything about wolves, a Tundra Wolf is a very large wolf. I am not going to get into the wolf hybrid thing here. That’s a whole other blog. My ex and I know nothing about wolf hybrids. We go to this house at 9 or 10 o’clock at night. 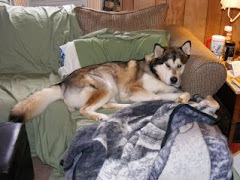 According the “breeders” the mother was 75% Alaskan Malamute/ 25% Tundra Wolf. The father was 75% Tundra Wolf/25% Alaskan Malamute. They billed the puppies as being 50/50 hybrid. If you are familiar with genetics, you know it just doesn’t work that way. The mother dog walked up to me, and her head was almost as chest level. I am almost 5’ 7”. Warning bells should have gone off, but they didn’t. The owners said that the mother weighed 175lbs and had lost weight nursing. Hello…were there red flags? Yes. But did I see them? No. That night eight week old Wulfgar came home to live with us. He was the most adorable creature on four legs. Eight week old Wulfgar weighed 17 lbs. That’s a lot of puppy. At the time, we lived in an apartment where you weren’t allowed to have pets. Good plan, huh? We were looking for a place to move, and eventually rented a small house. At the time we both worked, and the plan was to allow Wulf to have run of the basement during the day. The basement wasn’t fully submerged, there were windows, and it was nice and cool during the day. Wulf wasn’t having any of it. He was not interested in being inside whether it was cooler or not. So my ex-husband built him a dog house out of ¾” plywood, complete with green paint and a shingled roof. After a year we moved to another small house. After a few more years my ex-husband was gone. Wulf was a handful. I had taken him to obedience school, and he had done very well, but I have since come to the conclusion that he only let me think I was in charge. Wulf weighed in at 145lbs and looked like he weighed about 180lbs. Wulf and I went where we wanted, when we wanted, day or night. I had a Ford Ranger, and he rode in the back in a large wire dog crate. We had quite a few adventures together. I had people following me off the interstate to see him. One guy made me wait in McDonald’s parking lot until his wife could get there to see Wulf. We would go to Baskin Robbins for ice cream and people would gather around to watch. As he got older, it got to the point that it was annoying. I supposed he learned if from, but he eventually got to where he would just ignore most people. I would put on my invisible sunglasses, and away we would go. Unless someone was very insistent, we just ignored them most of the time. My ex and I had made it a point to socialize Wulf. I had bought a book about raising a wolf hybrid and realized that I had a lot to learn. At the time there was also a magazine called the Wolf Hybrid Times that I subscribed to for a time. It came in a brown paper wrapper so the neighbors couldn’t see what it was. If you don’t know, it is illegal to give a wolf hybrid a rabies vaccine which is just asinine. Therefore if a wolf hybrid were to bite some, he would be quarantined and his head cut off. This is the only to tell if an animal has rabies. 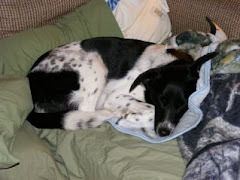 I had vets tell me that they didn’t want to know that he was a hybrid, and they gave him the rabies vaccine. So thus began Wulf’s life as an Alaskan Malamute or Alaskan Malamute mix. 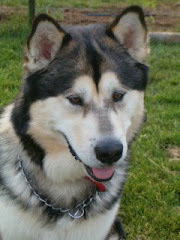 Most people didn’t know what a Malamute was to begin with. When my ex-husband left, Wulf and I lived at the end of a dead end street with no other houses around. I was never afraid. Where Wulf’s coat was so thick, it was too hot to do anything during the day in the summer time. So we would go out after dark. We haunted many a park in the midnight hours, and I had no fear. I have no doubt that Wulf would have protected me if there had ever been a need to, but no one was ever stupid enough to try. Wulf was with me when I need him most, when I was out on my own for the first time. Was I the pack leader? Probably not. We were what we were. I loved him, and I thought I was doing to best that I could for him. I would have done what I had to do if anyone had ever tried to hurt him. I would have given anything to save him, but in the end we could not beat cancer. 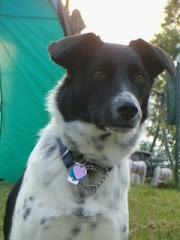 In December of 2003 my current husband and I found out that Wulf had bone cancer. I am not going to go into the whole story here. If you are interested in more details, you can check out my web page: www.lonewulfcreations.com. Wulf ultimately lost his battle with bone cancer on April 4, 2004. The vet that diagnosed Wulf gave us two options: either amputate his leg or don’t wait too long to put him to sleep. This was not acceptable to me, so I began doing tons of research at the library and online. There were so many things that I did not know, and it might have cost Wulf his life. 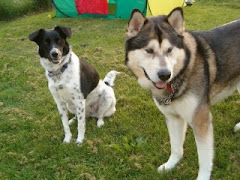 The two dogs that I have now, Weylin ( 4yr old Alaskan Malamute) and Maggie (4 Yr old Border Collie/Hound mix) have benefited greatly from what I have learned, but the price was so high.